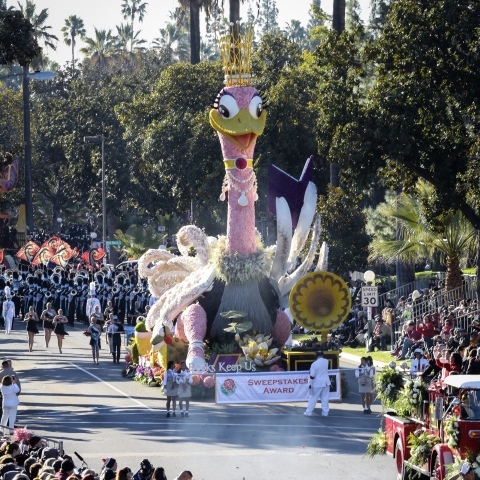 PASADENA, Calif.--(BUSINESS WIRE)--Fiesta Parade Floats, the most-awarded float-builder in Rose Parade history, ushered in 2019 with nine award-winning float entries at the 130th Rose Parade earlier today in Pasadena, California. Among the Fiesta-built winners announced today was the The UPS Store’s float entry, “Books Keep Us On Our Toes,” which was awarded the 2019 Sweepstakes Trophy, the Parade’s top prize, given to the parade’s most beautiful float entry. The 2019 awards add to Fiesta Parade Floats’ unmatched position as the most award-winning float-builder in Rose Parade history. Big Bear Rose Parade Association: “Play, Rest, Sleep” – Golden State Trophy for the most outstanding depiction of life in California. Dig Alert: “Backyard Harmony” – Past President Trophy for most outstanding innovation in the use of floral and non-floral materials. Dole Packaged Foods: “Rhythm of Paradise” – Wrigley Legacy Trophy for the most outstanding display of floral presentation, float design and entertainment. Donate Life: “Rhythm of the Heart” – Judges Trophy for the most outstanding float design and dramatic impact. Easterseals: “Celebrating Easterseals 100 Years of Disability Services” – Leishman Public Spirit Trophy for most outstanding floral presentation from a non-commercial participant. Northwestern Mutual: “Spend Your Life Living” – Bob Hope Humor Trophy for the most whimsical and amusing. Stella Rosa: “Taste the Magic” – Grand Marshal Trophy for most outstanding creative concept and float design. City of Torrance: “The Power of Music” – Tournament Volunteer Trophy for most outstanding floral presentation of the Rose Parade Theme among floats 35 feet and under. The UPS Store: “Books Keep Us On Our Toes” – The Sweepstakes Trophy for the most beautiful entry. Led by a talented and experienced team of Rose Parade veterans that includes president Tim Estes and vice president and floral director Jim Hynd, and backed by a group of world-renowned float designers and artists, Fiesta Parade Floats maintains the highest award win rate in the Rose Parade industry. In addition to the award recipients, Fiesta Parade Floats delighted parade goers with its entries for the AIDS Healthcare Foundation, Carnival Cruise Line, Chinese American Heritage Foundation and Kaiser Permanente. For up to date information and news on the 2019 Rose Parade floats, become a fan of Fiesta Parade Floats on Facebook, and follow the Fiesta Parade Floats Twitter feed, Instagram and YouTube channel. Based in Irwindale, CA, the 2019 Rose Parade is Fiesta’s 31st year as a world premier float-builder. Fiesta Parade Floats is considered a leader in both floral technology and floral application within both the float and floral industries. Maintaining the highest award win rate in the Rose Parade industry, Fiesta also builds custom props for television commercials, feature films, exhibits and theme parks. For more information, visit http://www.fiestaparadefloats.com.